The fireman's motto "Everyone goes home” rang true for an antique fire truck used by the Burlingame Fire Department from 1938 to 1962. 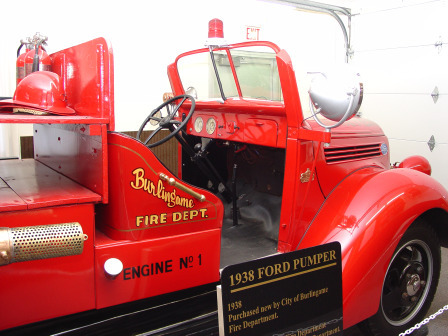 The city of Burlingame purchased its first pumper open-cab fire truck in 1938 for $1,900. The truck was equipped with a Barton-American 300 gallon/minute front mounted pump, a 2½ inch fire nozzle, fire buckets, 300 gallon water tank, two ladders, and an electric siren. This was quite an upgrade from their previous equipment. The new truck was used to fight one of the biggest fires in the city's history – that being the S.S. Smith Lumberyard. Later in the middle 1950s, the 1938 pumper truck was again called upon to fight a major fire in the business district at the Burlingame Locker Plant. The truck was sold to the Melvern Fire Department in July 1962 and used by that department until 1987 when it as sold to Tan-Tar-A Resort in Missouri. The folks there restored the fire truck to its original condition and used it in special activities and parades. In 2002, the Burlingame Asst. Fire Chief tracked the truck to the resort and inquired about borrowing the fire truck for local festivities. Tan-Tar-A Resort instead donated the fire truck back to the Burlingame Fire Department. Several men from Burlingame drove to Missouri to pick up the truck, and after 40 years, it was returned home. The fire truck is currently on display in the fire station exhibit at the Schuyler Museum Annex but can also be seen, weather permitting, in special event parades held in the community. Taken from the Early History of Burlingame Fire Department, written by Tom Oliver, 1989. Open Wednesday 1-4 p.m.; Friday 1-4 p.m.; Saturday 10 a.m.–4 p.m.; Sunday 1–4 p.m. Also open by appointment and special request.